A couple of days ago I got an offer in the mail for a Chase Sapphire card. Normally I don’t even open these things, but this one came in such an opulent bit of packaging that I wanted to see what was inside. Answer: nothing much. It was just a box designed to look thick and inviting with only a few pieces of paper inside. But having opened it, I went ahead and read the offer. 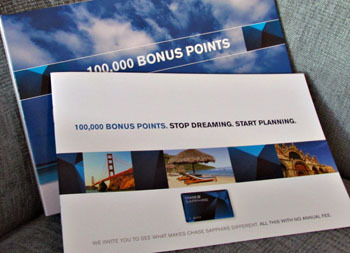 Here’s the deal: Chase is so anxious for me to try their card that if I sign up they’ll give me 100,000 bonus points if I spend $500 in the first three months — something that’s obviously not much of a problem. Once I’ve done that, I can cash in those points for $1,000. In other words, Chase is basically willing to pay me $1,000 just to try their card. As near as I can tell, there are no gotchas, and a quick Google search seems to confirm this. Merely getting me to give Sapphire a try is worth a thousand bucks to them. So what’s going on here? Either (a) we’re in the middle of some kind of fantastic credit card bubble and it’s going to burst soon, or (b) the high-end credit card business is so insanely lucrative that paying people $1,000 just to sign up is worth it to them. I’m not sure which one I fear the most.